Anni was born in Kronstal, Ukraine on February 8, 1923. She was the eldest child of Johann Niebuhr and Anna Krahn. Her father was a victim of the Stalin Gulag and was not heard from after he was taken in 1938. They would learn much later that he died in 1942. 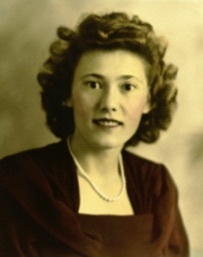 Tragedy again struck her family in 1941, when Anni’s brother Peter drowned accidentally. Anni completed her high school in Schoenwiese (now part of Saporoschje) and Osterwick in 1941. During these years, she had to look after the house and her younger siblings while mother was at work. When she graduated, she received a scholarship to study engineering in Simferopol in the Crimea, but by then war had broken out between Germany and the Soviet Union. This was to change her life forever. For two years, Ukraine was under relatively benign German control and Anni found employment with the German administration as an interpreter. After the German defeat at Stalingrad at the end of 1942, the Germans made plans to evacuate the entire ethnic German population in Ukraine, including 35,000 Mennonites. Anni, her mother, and her sister Lydia, along with a number of other Kronstal families were settled in Yugoslavia. Eventually because of constant guerilla attacks and the advancing Soviet army they were evacuated into Eastern Germany. Here they settled in a small village, Grosz Ammensleben, on the outskirts of Magdeburg. Anni’s brother Hans was drafted into the German army and sent to the crumbling eastern front in Poland, where he was captured by the Soviets and sent to Siberia as a prisoner of war. Released after the war, he worked in coal mines, which undermined his health, and he died in 1962 at the age of only 37. In Magdeburg, Anni worked with the civil service. Although the Americans reached Magdeburg first, the war ended with that territory relinquished to the Soviets. When Anni learned from a friend of Soviet plans to repatriate all former citizens of the Soviet Union, she rounded up family and relatives and they made their way to the nearest check point in the boundary between the Soviet and British zones. At the time the occupation zones were still somewhat fluid, and they were able to cross the zone boundary at Helmstedt into the British zone and to the city of Hannover. Here Anni worked in the town of Einbeck, and Lydia could go to school in Edemissen. Anni had been baptized in East Germany, and in Hannover, she was accepted into the Göttingen Mennonite Church. In 1948, with help from Canadian relatives, they immigrated to Winnipeg, Canada, and began a new life. 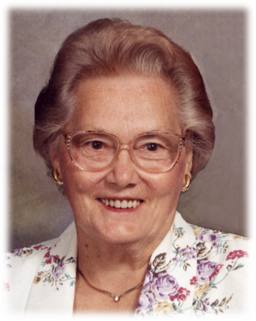 She married Gerhard Ens on August 19, 1950, and they moved to Gretna, where Gerhard taught at the Mennonite Collegiate Institute (MCI), and where their five children were born and raised. Anni quickly earned a reputation for cooking and entertaining, especially for her famous MCI-teacher Christmas banquets. In the later years in Gretna, when the children were all in school, she became the head cook at the MCI residence. In 1977, after nearly 30 years in Gretna, they moved to Winnipeg, where Gerhard became editor of Der Bote, and Anni joined the cooking staff at Canadian Mennonite Bible College. Both became active members of the Sargent Avenue Mennonite Church. They hosted reading groups, clergy meetings, Bible studies, and various conference delegates, and Anni’s culinary reputation continued to grow. In 2008, when Gerhard was admitted to the Donwood Manor Personal Care Home, Anni moved into the nearby Kingsford Haus from which she made daily visits to see him. Anni had an indomitable will and was the foundation of her family. Wherever she lived was home. Her love for entertaining and cooking, especially for her children and grandchildren, never waned, and until the second last week of her life she was preparing meals for them.